Sophisticated entertainer. 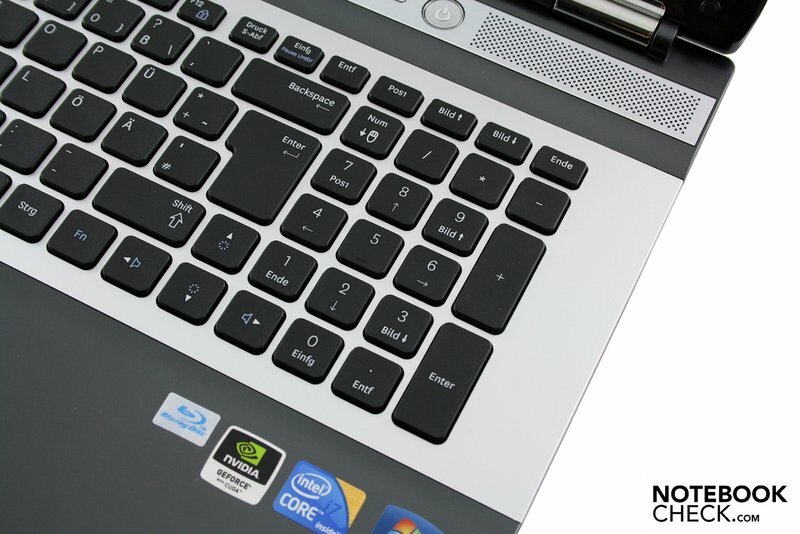 Looking for a 17-inch multimedia notebook which not only looks stunning but also has some power under the hood? Look no further than the Samsung RF710. A quad-core processor, 6 GB of RAM and a Blu-Ray DVD drive are just a few of the highlights. Samsung’s new multimedia machine, the RF710, is currently available in Germany in two different models. The NP-RF710-S05DE model is the entry-level version, on sale for around €900. With the latest Intel dual-core processor (Core i5-460M), 4 GB of DDR3 RAM (2 x 2048 MB), a 640 GB hard drive (5,400 rpm) and an Nvidia GeForce GT 330M, it promises to provide solid mid-range performance. 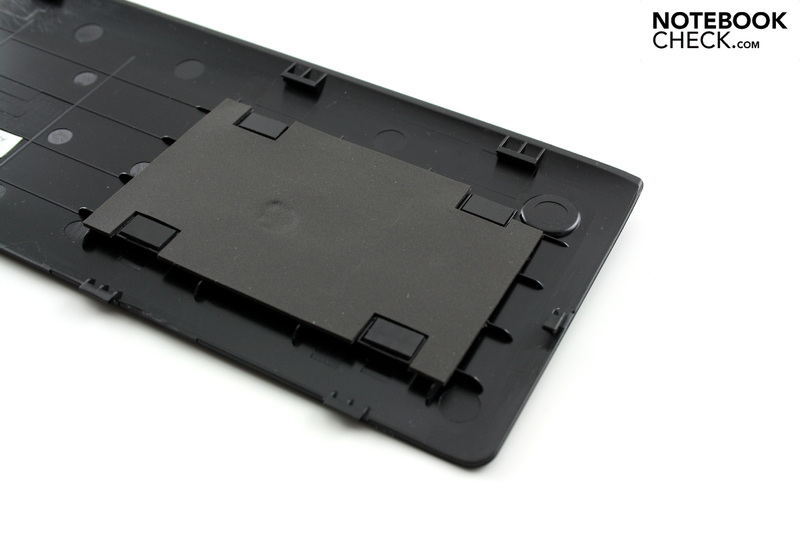 The model we are testing, the NP-RF710-S06DE, is considerably more expensive at around €1,340. The RAM has been increased to 6 GB (4096 MB + 2048 MB), but the hard drive capacity has been doubled to give a generous 1000 GB (2 x 500 GB, 5,400 rpm). For the graphics card, Samsung has opted for a GeForce GT 420M which supports DirectX 11. Meanwhile, the quad-core processor is probably the best feature, a high-performance Intel Core i7-720QM. In a couple of respects the two models are the same. For example, both come with the integrated Blu-Ray player, which will delight movie fans by delivering razor-sharp picture quality, and can also burn DVDs and CDs. The operating system is more mundane - Windows 7 Home Premium 64 Bit, which is used by the majority of notebook manufacturers. 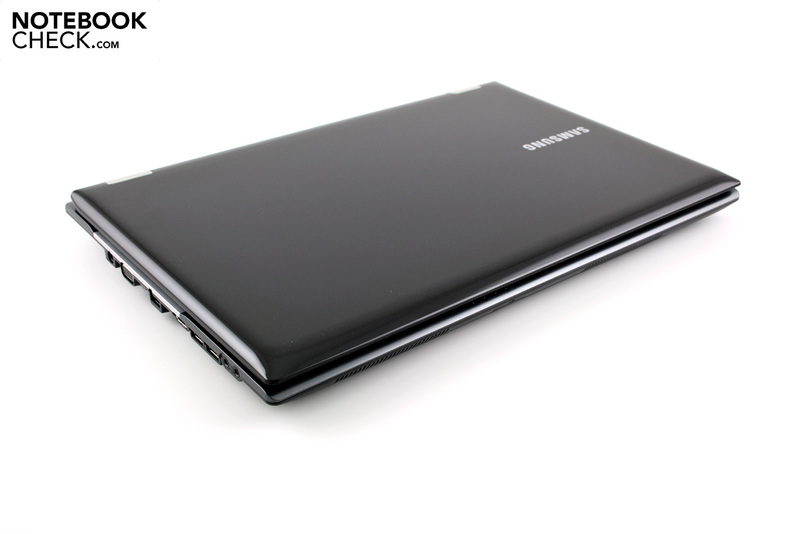 Incidentally, anyone who would rather have a smaller 15-inch machine can look instead at the Samsung RF510. 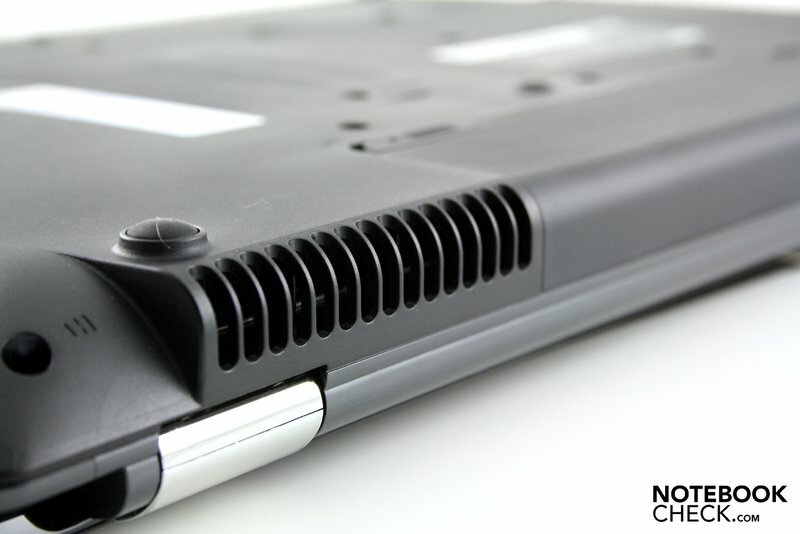 We would describe the Samsung RF710’s design as a success. The lid has a blue-black high-gloss finish all over, while on the inside, dark brown matt plastic surfaces (palm rest) alternate with silver-coloured imitation metal (keyboard bed). 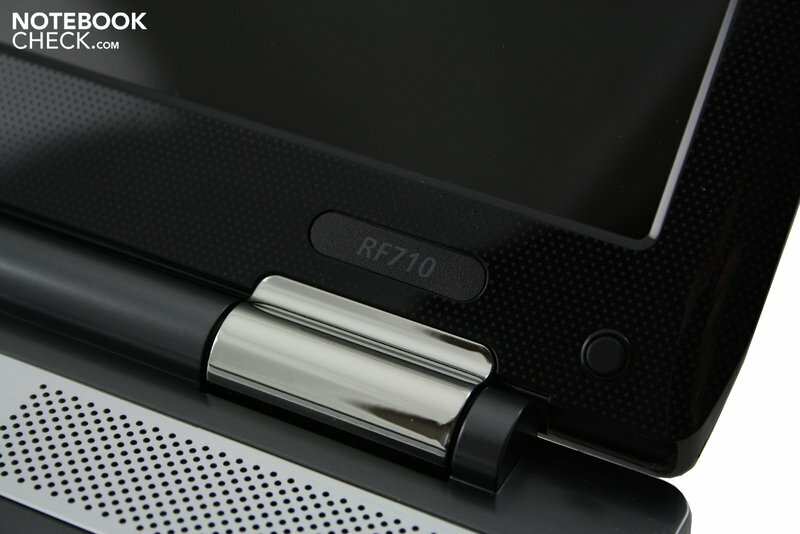 Small details like the shiny silver hinges provide further accents and give the Samsung RF710 a fresh look overall. The appearance and feel of the materials is good, and the workmanship impressive. However, the lid and screen edging are highly susceptible to dirt and fingerprints, which quickly gain the upper hand. The case is also far from perfect in terms of robustness. The wobbly lid can be flexed quite some way and the upper side of the base unit also flexes inwards under strong pressure. Finally, the hinges could also do with some improvement, as they do not hold the lid in position firmly enough when there is shaking from below, and yet when the laptop is opened they pull the base unit along with the lid. 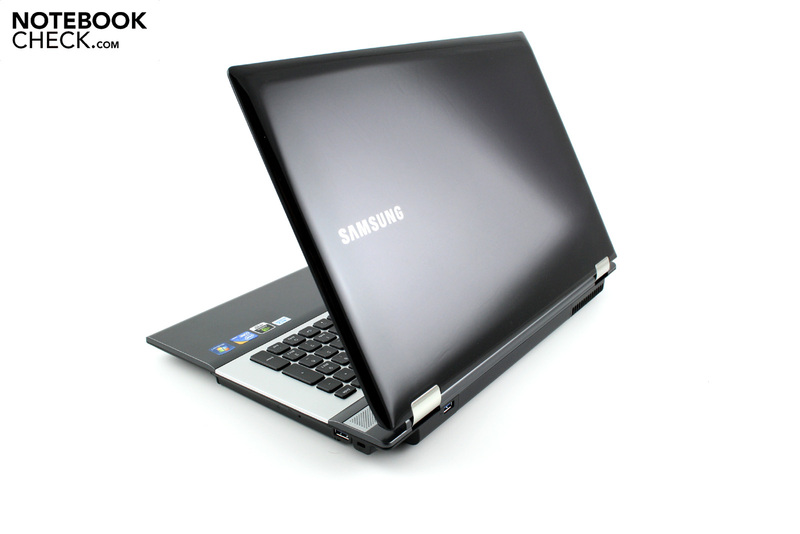 Despite its large 17-inch format, the Samsung RF710 can still be transported relatively easily. It weighs just under 3 kg and is around 4 cm high, making it neither heavy nor bulky. Although the Samsung RF710 gets credit for its two advanced USB 3.0 ports, the range overall is actually rather modest. 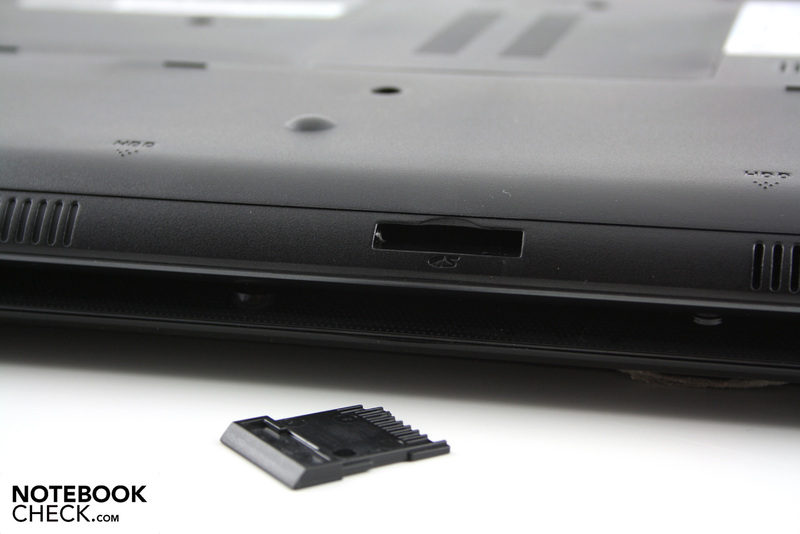 Samsung has skimped on an ExpressCard slot as well as ports for FireWire and eSATA. 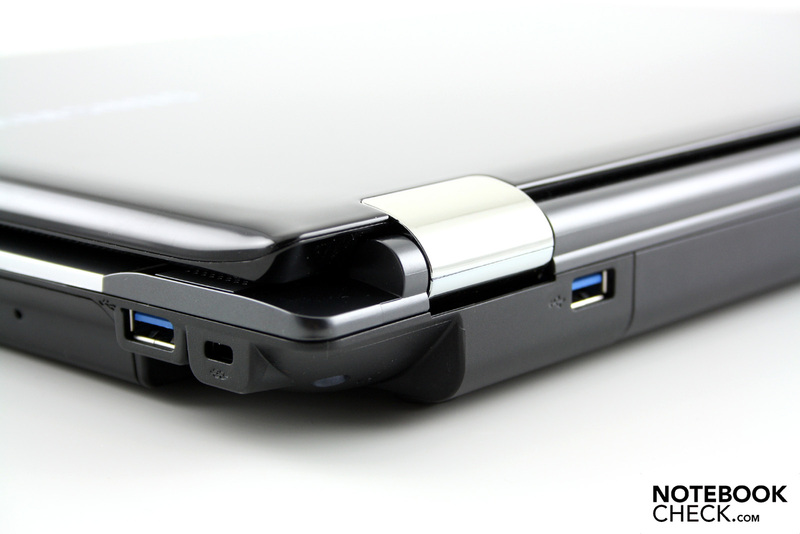 The back edge of the laptop houses one of the aforementioned USB 3.0 ports; on the front edge there is nothing but a multi-in-one card reader. 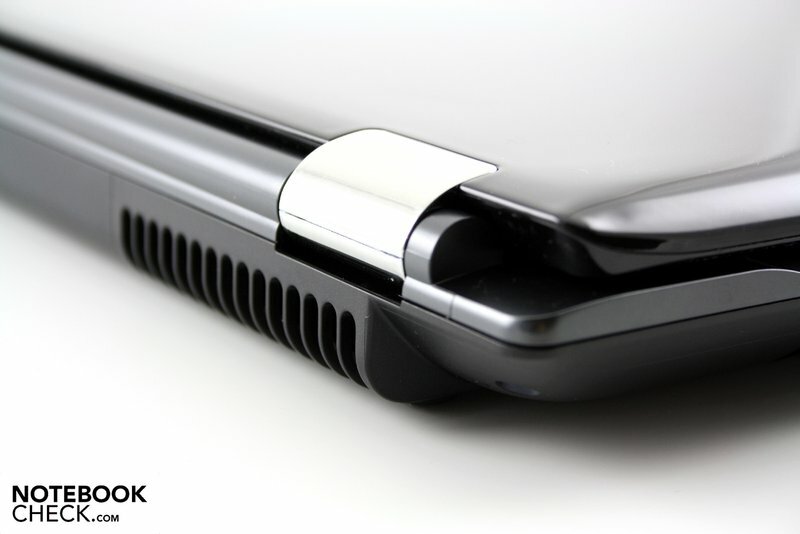 The right side has the obligatory Kensington lock slot as well as another USB 3.0. Most of the ports have been positioned on the left-hand side. The power socket, VGA, and RJ-45 Gigabit LAN port are all waiting to be filled with cables. The left-side is then rounded off by an HDMI port, two classic USB 2.0 ports and two audio ports (headphones, mic). We were not entirely happy with the layout of the ports; particularly on this left-hand side where many of the ports are annoyingly far forward. Wireless communication is no problem with the RF710; Samsung has included WLAN (802.11n) as well as Bluetooth (Version 3.0). Unfortunately Samsung, like a great many other manufacturers (eg. 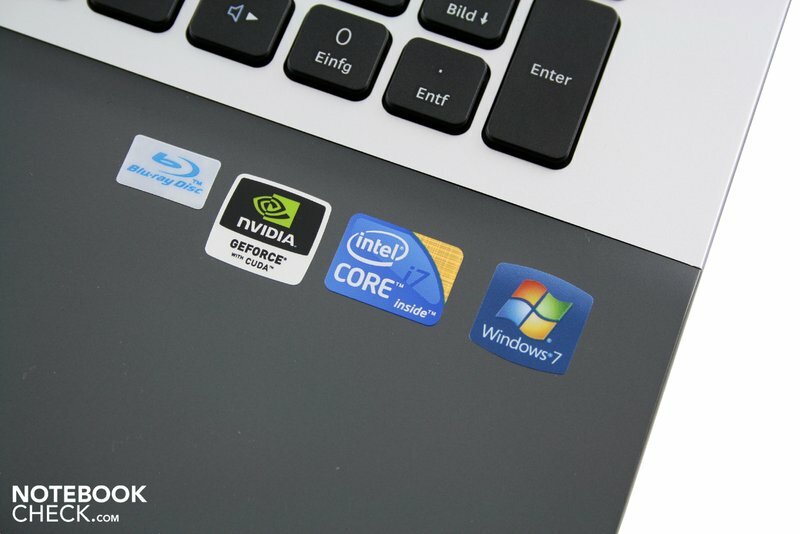 Asus, Acer, Toshiba and Sony), has completely overdone it when it comes to pre-installed software. As you can see on the screen-shot to your right, the add/remove programs list in Windows is stuffed full of unnecessary bloatware and software from third parties. This not only makes for a slower start-up but also has negative effects on the overall response speed (particularly just after start-up). You should definitely clean up your system right away, to allow your Samsung RF710 to show its true potential. 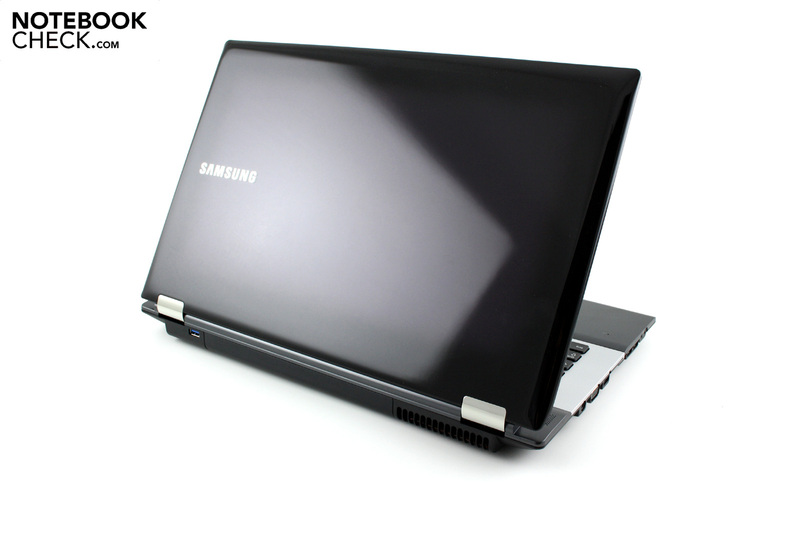 Do not expect to find much in the way of accessories included with the Samsung RF710. The box is empty apart from the surprisingly dainty 90 W mains adaptor and a few information booklets. As for recovery disks, you will have to create them yourself. The Samsung RF710’s basic warranty is the standard 24 months; however you can extend this as desired to 36 or even 48 months within the first 90 days after purchase. 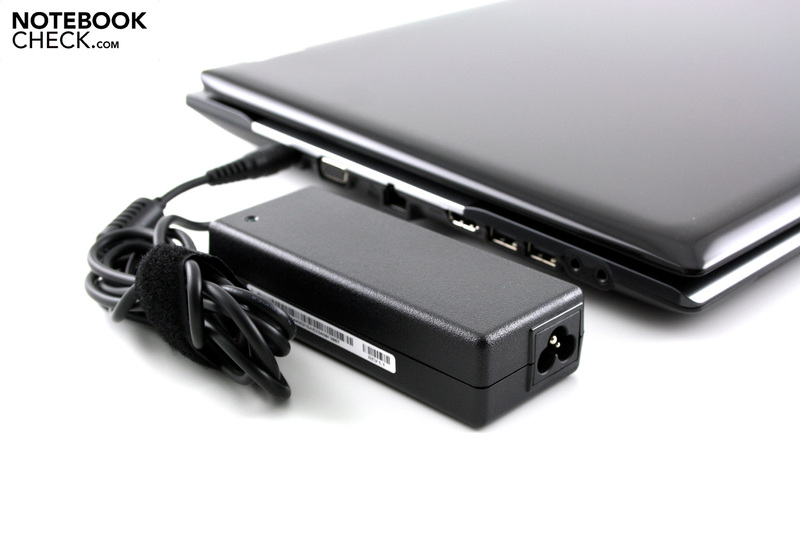 The good input devices are one of the Samsung RF710’s best features. The pebble-style, clearly marked keys are impressive; they make an excellent sound when pressed, are intelligently laid out, and have a good typing feel with respect to feedback and impact. 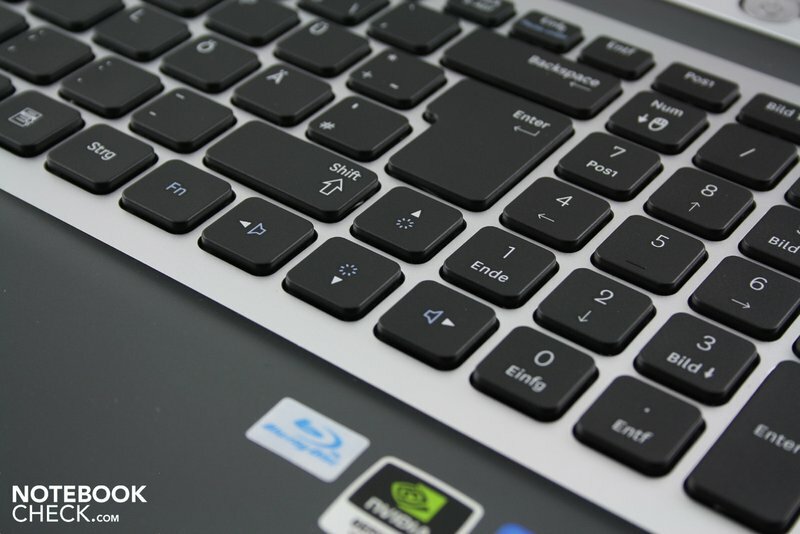 Further points in the keyboard’s favour are the dedicated number block, hot keys for volume and WLAN and its two Fn keys (though the keyboard is not backlit). The keys are 15 mm x 15 mm which is not especially large, but during our testing we had virtually no problems with typos. The touchpad is the same colour as the surrounding palm rest and is set in a slight depression. It lives up to the high standard set by the keyboard in every way, starting with the touchpad surface which is relatively smooth and very easy to slide across. It is a good size (90 mm x 54 mm), allowing you to cover longer distances; and it supports mouse gestures and multi-touch gestures. 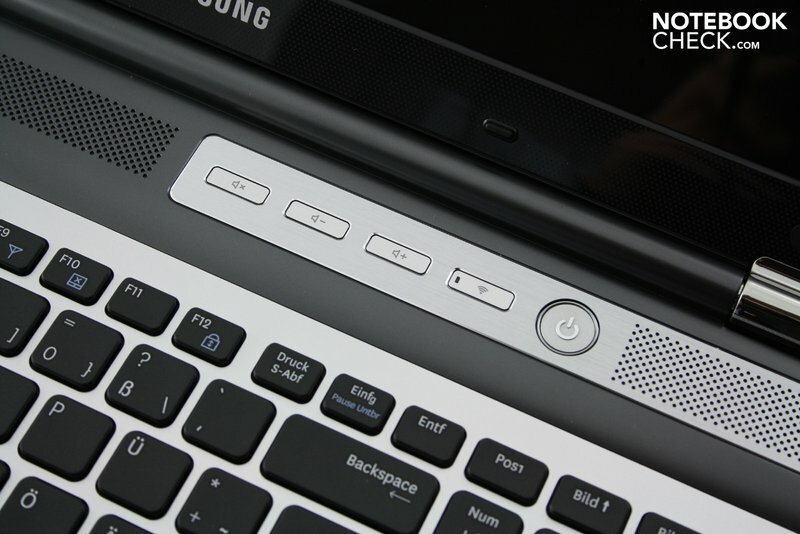 The clearly defined touchpad buttons are the icing on the cake. But to minimize the risk of accidental inputs, gamers should probably deactivate the touchpad whilst playing. The 17.3-inch screen has, unsurprisingly, an aspect ratio of 16:9 and a 1600 x 900 resolution. Combined with a screen diagonal of 43.94 cm, this gives you plenty of room to work comfortably with several windows open next to each other. Unfortunately the picture quality is not particularly amazing. 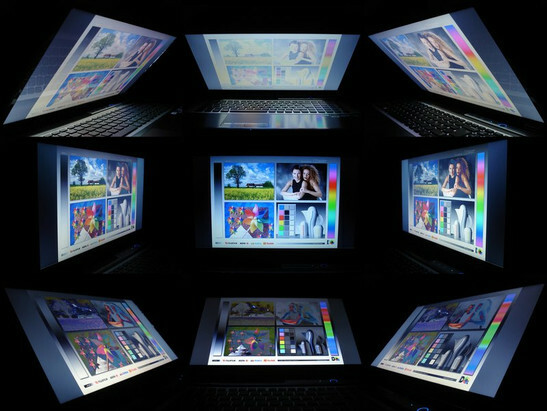 The manufacturer’s own-brand LTN173KT01000 screen is impressively bright with an average of 248.8 cd/m², not least because of the LED backlighting, but in all other aspects there are substantial shortcomings. The black level is quite high at 1.64 cd/m², so that dark sections do not appear a deep black but actually have an unsightly greyish tinge. The contrast ratio also comes in at a disappointing 155:1, and the glossy screen surface can mask these deficiencies only slightly. But at least the intensity of the colours is more or less satisfactory. Despite the excellent screen brightness the Samsung RF710 is not especially suitable for outdoor use. This is because of the glossy finish which picks up irritating reflections when the light falls on it. Even indoors you have to take great pains to position yourself so you are not underneath a window or opposite one. The viewing angles also leave something to be desired. Both horizontally and vertically, even small changes in angle cause the picture to change. So a cosy night-in watching a movie with several friends is possible but will not be problem-free. 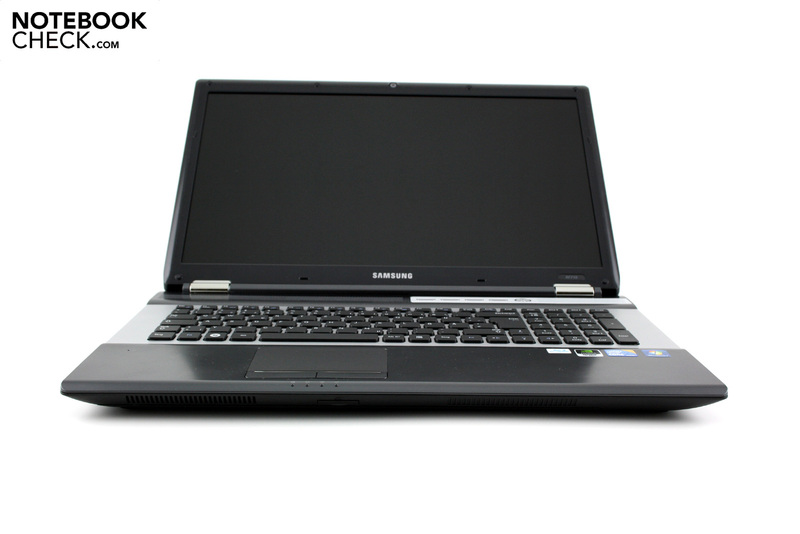 To guarantee a high level of performance, Samsung has equipped the RF710 with a quad-core Intel processor. The Core i7-720QM may only have a speed of 1.60 GHz in its initial state, but with Turbo Boost technology the speed can increase to as much as 2.80 GHz depending on the demands on the processor and the temperature. Hyperthreading also benefits applications that have been specially optimized for it, allowing the Core i7-720QM to use four virtual cores alongside the four real ones. The notebook’s claims to high-end performance are further supported by the fast L3 cache, which is generously sized at 6 MB. However the Core i7-720QM does without the integrated graphics chip that the Core i3 and i5 series processors have, and so manual or automatic graphics switching is unfortunately not possible. 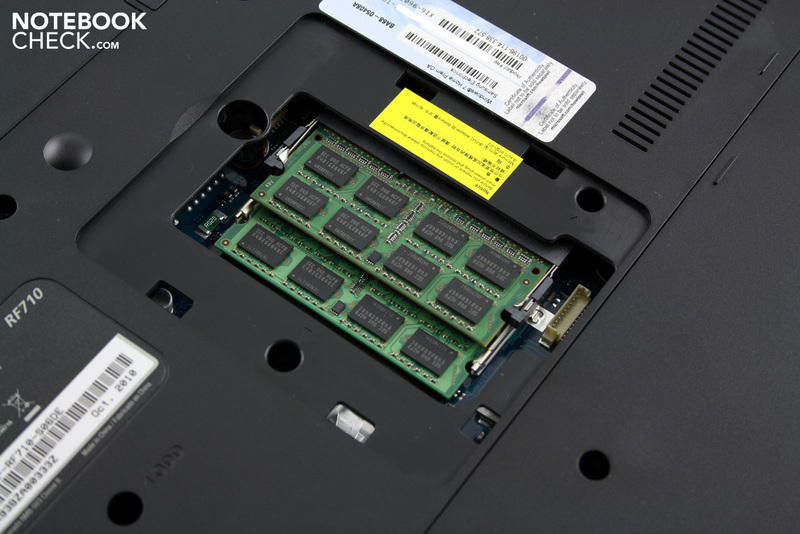 One further shortcoming is the energy consumption; a 45 W TDP is relatively high for a notebook. In the CPU benchmarks, the Core i7-720QM had to hold its own against the fastest dual-core processor at present, the Core i7-640M. Thanks to its higher speed (up to 3.46 GHz with Turbo Boost), the Core i7-640M finishes significantly ahead of the Core i7-720QM in the single-core rendering Cinebench R10 (64 bit) test, with 4,583 points to 3,741 points, an advantage of 23%. In the multicore rendering (64 bit) test, however, the higher number of cores (including virtual ones) helps the Core i7-720QM to a score of 10,345 points, beating the Core i7-640M with its 9,512 points. Compared to the very powerful processor, the graphics card is something of a step-down. Instead of a high-end GPU, the RF710 has a mid-range model, Nvidia’s GeForce GT 420M; it is made with the modern 40 nm process and has a respectable 96 unified shaders (compare with the GeForce GTX 460M with 192 shaders). Samsung has not risked any experimentation with the speeds; 500 MHz (core), 800 MHz (memory) and 1000 MHz (shaders) are standard values. The weak point of the GeForce GT 420M is the narrow memory bus of only 128 bits, whose negative influence shows particularly at high resolutions and graphics settings. The 2048 MB DDR3 video memory is not much help either in avoiding bottlenecks, and wouldn’t be even if it were faster GDDR5-VRAM. But the GeForce GT 420M makes up some of the lost ground with its comprehensive list of features; as well as DirectX 11 and PhysX (GPU-based physics acceleration) the mid-range GPU also supports CUDA (for general computation) and PureVideo HD (for decoding HD material). As well as the more practical gaming tests we looked at the performance of the GeForce GT 420M using synthetic graphics benchmarks. We decided to pitch it against the incredibly popular Mobility Radeon HD 5650, the graphics card from AMD/ ATI with an excellent price-performance ratio. To cut a long story short: in all versions of the 3DMark test by Futuremark, the GeForce GT 420M did not manage to keep pace with the Radeon HD 5650. The ATI graphics card had its nose in front by 26% in the 3DMark 03 test (20,089 points to 15,972), by 10% in the 3DMark 06 (6,774 points to 6,148), and by 9% in the 3DMark Vantage benchmark, GPU score (2,749 points to 2,514). Anyone with vast amounts of data to store will be happy with the combination of hard drives in the RF710. Samsung has fitted it with two 500 GB HDDs each with 5,400 rpm. The HD Tune tool says that the system hard drive has a reasonable transfer rate of 69.4 MB/s on average. The sequential read rate of 78.14 MB/s and sequential write rate of 70.97 MB/s are also not to be sniffed at (CrystalDiskMark). As you might expect with a powerful quad-core processor and a generous 6 GB of DDR3 RAM, the Samsung RF710’s application performance is of a pleasantly high level. 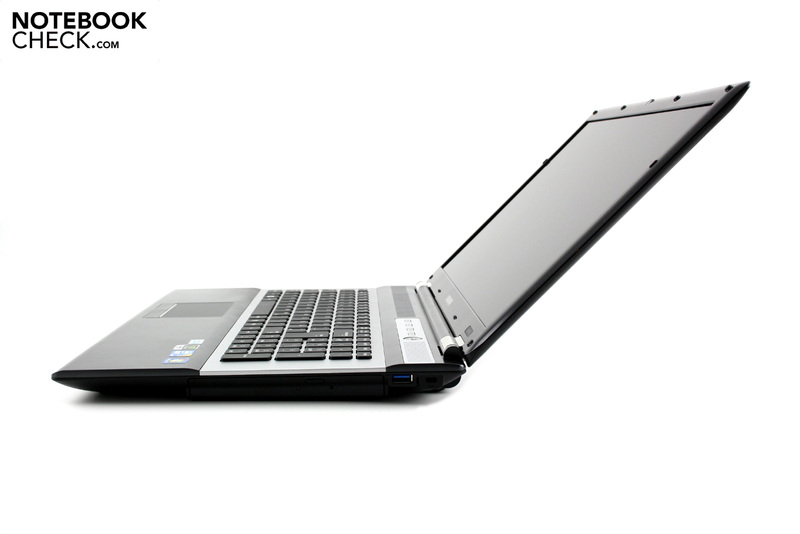 The notebook is particularly well equipped with a Blu-Ray player and a 1000 GB hard drive capacity. The graphics card is the only thing which can’t quite keep pace with the rest of the hardware; for €1,340 we would at least have expected a GeForce GT 445M. For comparison purposes for gaming performance, we again turned to the Mobility Radeon HD 5650. The results featured below come from our testing of the multi-talented 17.3-inch Acer TravelMate 7740G. In this action game’s integrated benchmark the GeForce GT 420M is hopelessly overstretched by the higher graphics settings. High details, 16 x AF (anisotropic filtering) and a resolution of 1920 x 1080 brought the Samsung RF710 down to a lowly 14.9 fps. Admittedly the game does not play completely smoothly on the same settings on a Radeon HD 5650 either, but at 22.4 fps the frame refresh rate is around 50% better. In the RF710’s native resolution, you will not really be able to get beyond the medium detail setting, and even in a 1366 x 768 resolution the game does not run entirely smoothly (25.1 fps) with high details and 16 x AF. The low system requirements of this latest installment of FIFA have the positive effect that you can turn all the graphics straight up to their highest settings. With high details, 4 x AA (anti-aliasing) and a resolution of 1920 x 1080 we measured an excellent 52.3 fps. This even puts the GeForce GT 420M ahead of the Radeon HD 5650, the latter having to make do with 45.3 fps. The GeForce GT 420M is a moderately powerful, mid-range graphics card which can play modern games smoothly, often on their medium or high details settings. But this statement is only true if you do not overdo it with the resolution and the visual enhancements (anti-aliasing, etc). The Nvidia GPU is really designed for moderate resolutions in the region of 1366 x 768. We would certainly recommend that more demanding gamers go for a high-end graphics card like the Radeon HD 5870 or the GeForce GTX 460M. Low emissions readings are one of the Samsung RF710’s greatest strengths. We were particularly pleased with the noise in idle; the fan whirs along gently and is barely audible. The hard drive and DVD drive are also nice and quiet. Under heavy use the volume level hardly increases at all - unlike most other notebooks - and it does not drown out the background sound in films and games. Only maximum stress (Prime & Furmark) can drive the fan up to a clearly audible level. But the RF710 is at no point distressingly loud; the notebook would be a good choice for users who are sensitive to system noise. The increase in temperature is also reasonable. In idle the surface temperature does not go beyond 30 °C; the top of the base unit is pleasantly cool. Under heavier use the top becomes moderately warm, and gave a reading of almost 38 °C in the area of the WASD keys. The underside of the base unit did not do quite as well, with the temperature exceeding 50 °C in the area of the fan, making it less than ideal to have on your lap. A similar picture emerges with the hardware temperatures. In idle the GeForce GT 420M and Core i7-720QM are excellently cooled at around 37 °C and 40 °C respectively. But with full CPU usage the temperatures rise relatively sharply, though the maximum of 85 °C for the processor and 86 °C for the graphics card are no cause for alarm. The problem is that during our stability test with the Furmark and Prime tools, which lasted for several hours, the processor slowed down from 1.60 GHz to 1.33 GHz after a while (CPU throttling). Fortunately we did not see this have any negative effects on the comprehensive application performance and gaming benchmarks. (+) The maximum temperature on the upper side is 37.9 °C / 100 F, compared to the average of 36.5 °C / 98 F, ranging from 21.1 to 71 °C for the class Multimedia. (±) The average temperature of the palmrest area of similar devices was 29.1 °C / 84.4 F (+0.5 °C / 0.9 F). The two speakers, positioned above the keyboard, made a moderately good impression on us. Their maximum volume was unusually loud; but on the other hand the sound was a little imprecise and unfocused. The lack of a subwoofer also makes for very weak bass tones. 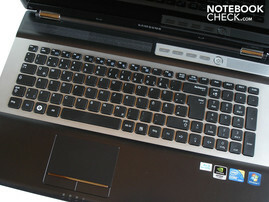 That said, the sound quality is better than that offered by most multimedia notebooks. External speakers can easily be connected via the 3.5 mm audio port; in our test the sound output was without any problems whatsoever. Portability is not one of the Samsung RF710’s strong points. Without graphics switching and with a mere six-cell lithium ion battery (48 Wh, 4400 mAh) the battery life is pretty poor. Under heavy use (Classic Battery Eater test) and with maximum brightness and no energy-saving options, the notebook only lasted 45 minutes. Watching a film without being plugged in to the wall socket is not really an option, as the RF710 lasted only 75 minutes in the DVD test with moderate energy-saving options enabled; not nearly enough to get through most movies. During wireless internet surfing the 17-inch notebook lasted for just under two hours. 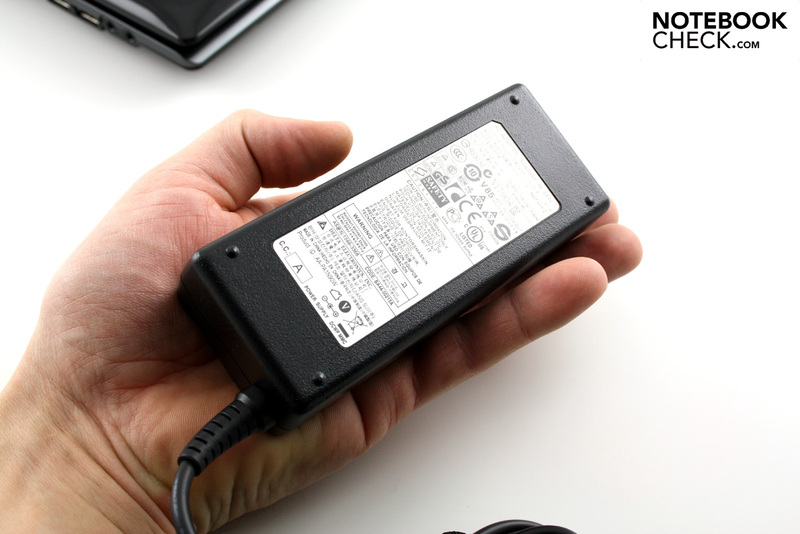 Only under the optimal conditions of the Battery Eater Readers test does the notebook achieve a respectable battery life; with minimum screen brightness and maximum energy-saving options it passes the three-hour mark. 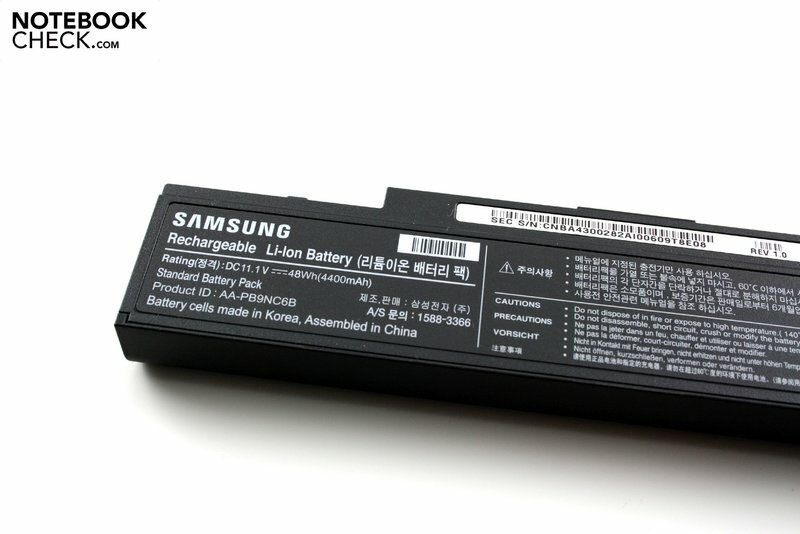 This limited portability is the reason that the Samsung RF70 is denied a higher rating overall. The notebook’s energy consumption is not entirely convincing. 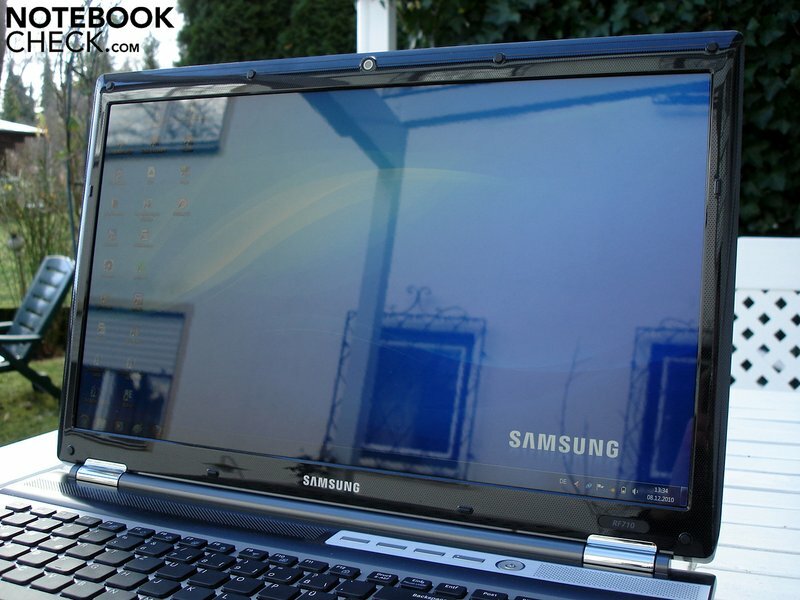 While in idle, the Samsung RF710 uses 15.9 - 25.5 W, a similar amount of energy to equally fast 17-inch notebooks (e.g. the Dell Studio 1747). 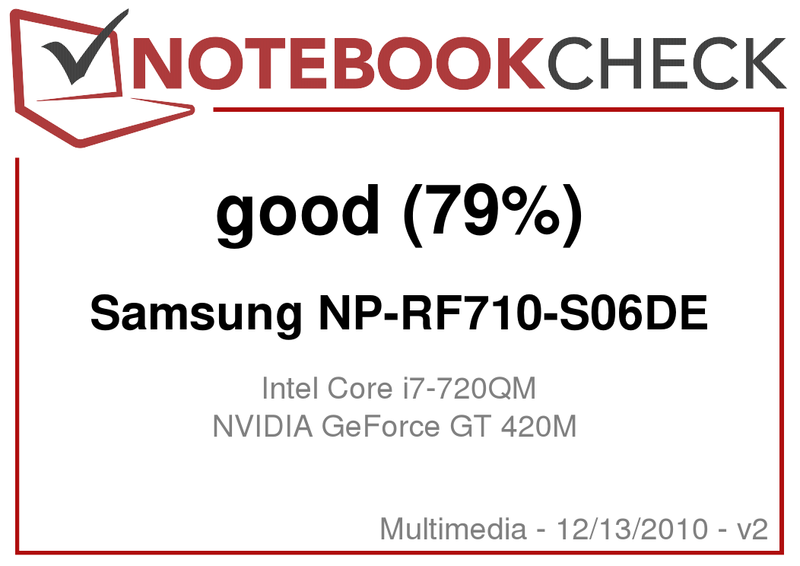 However, the energy consumption under heavy use is relatively high at 74.6 - 110.2 W.
The Samsung RF710 is without a doubt a solid multimedia notebook, which most people would be happy to own. 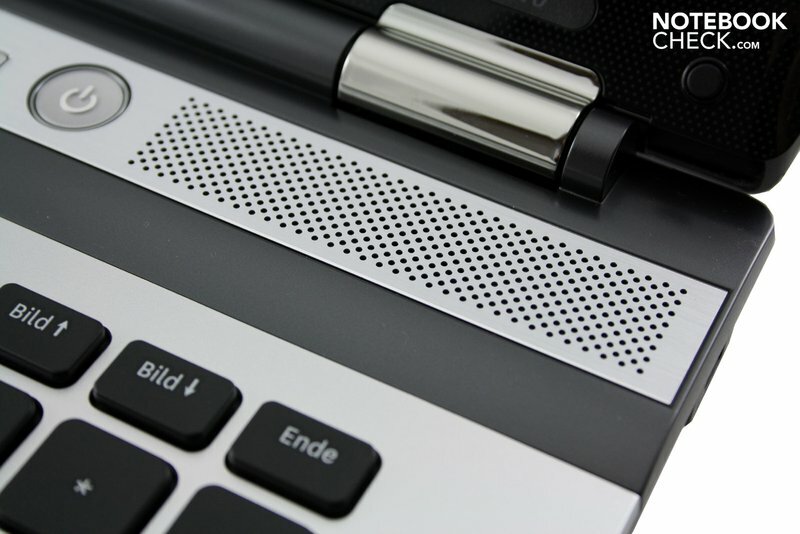 Flawless input devices and relatively low temperature and noise emissions top the list of the notebook’s positive features, making it a very easy laptop to work with. Film fans will be well served by the Blu-Ray drive, while the Intel Core i7-720QM ensures excellent application performance. But the Samsung RF710 is not free from problems either. Our number one request would be a better screen, as the black level, contrast, and viewing angles are not even close to being appropriate for a €1,340 multimedia notebook. And Samsung has also been stingy with the ports, deciding against an ExpressCard slot or Firewire or eSATA. Along with this comes the mediocre battery life, which condemns the RF710 to a rather stationary existence. We were also slightly disappointed by the gaming performance, as the GeForce GT 420M is often overstretched by modern games when in its native resolution of 1600 x 900. In short: if you can live with reduced portability, a limited selection of ports and a not particularly high-quality display, the Samsung RF710 could be a good pick for you. The RF710 is available from around €1,300 from a range of online stores. 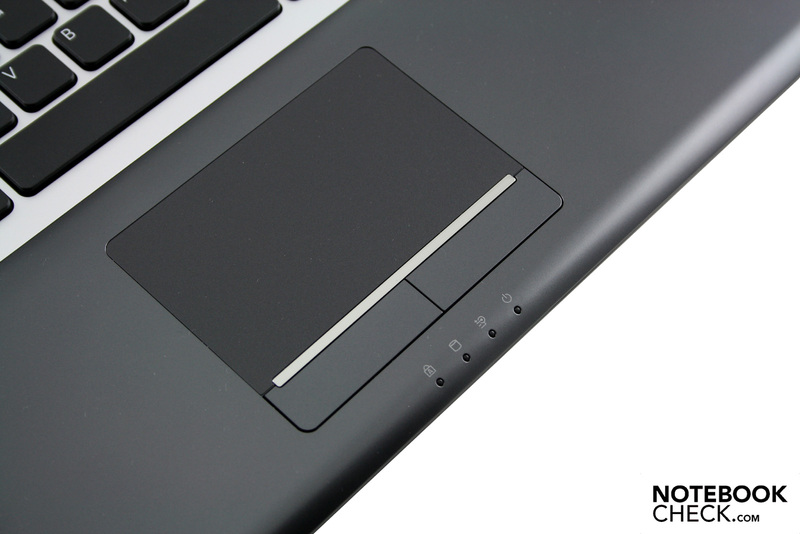 The notebook lid has a smart high-gloss black coating. The pebble-style keys are a reasonably good size. The right-hand loudspeaker distorted a little under heavy pressure. A dedicated number block is standard for a 17-inch machine. 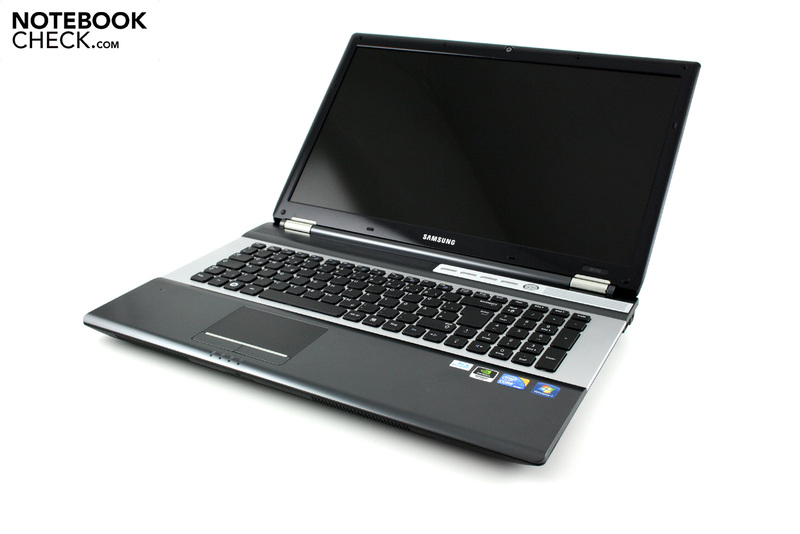 With a Core i7 processor and a Blu-Ray player, the RF710 is well equipped. 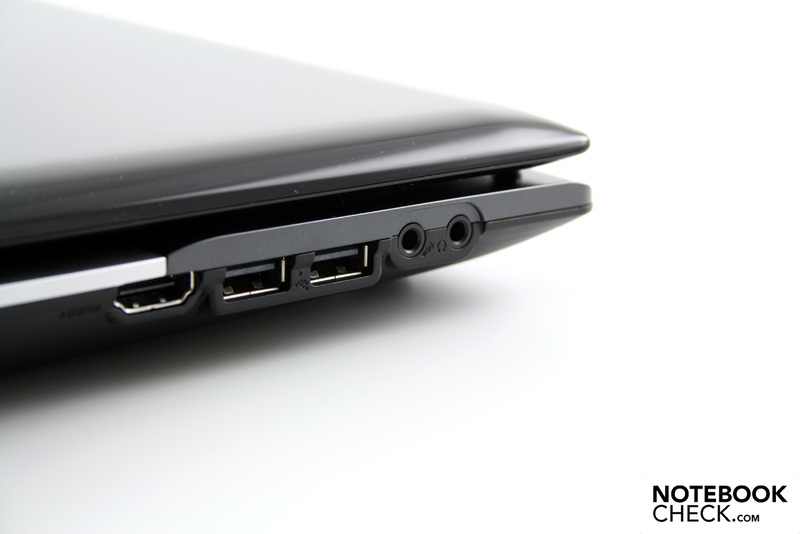 The battery slots conveniently into the back of the laptop. The battery life is rather poor. The mains adaptor (included) gets very warm with heavy use. The 90 W mains adaptor is surprisingly dainty. Power socket, VGA and RJ-45 Gigabit LAN are well positioned. The fan only speeds up significantly when the laptop is running flat out. On the front edge, a multi-in-one card reader is tucked away. The silver hinges look very classy. It is still quite unusual to see two USB 3.0 ports on a laptop. Useful special function keys for volume and wireless communication. The screen edging draws attention to itself with a smart dotted pattern. The 17.3-inch case is still relatively slim with a height of just under 4 cm. Several different shades provide nice accents to the design. Apart from the lid and screen edging, the RF710 is not very susceptible to dirt and fingerprints. The maximum opening angle is not particularly impressive. We have no complaints when it comes to workmanship. Most ports are positioned on the left-hand side. The input devices were completely convincing. The case has space for a maximum of two hard drives. There are padded surfaces on the cover for the hard drives. The performance of the two HDDs is fair to good. Six GB of DDR3 RAM is more than enough for the next few years. 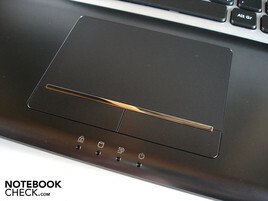 The touchpad has a good size and is pleasantly smooth. 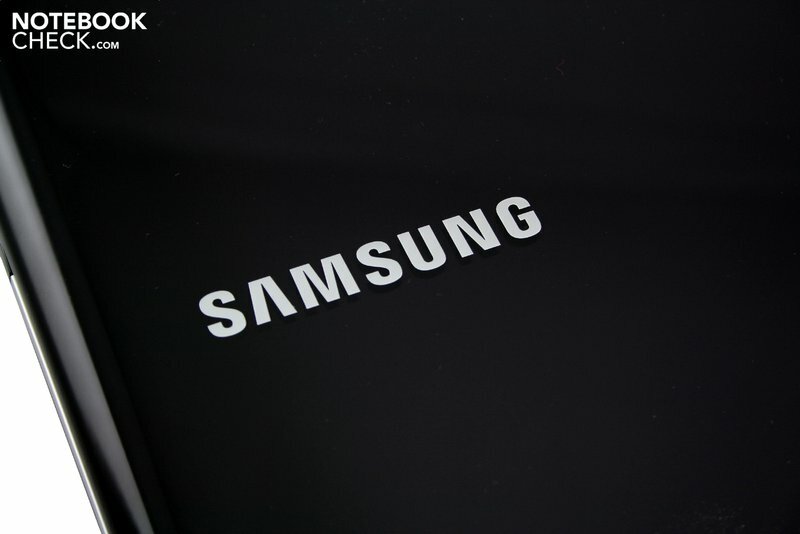 The Samsung logo adorns the notebook lid. 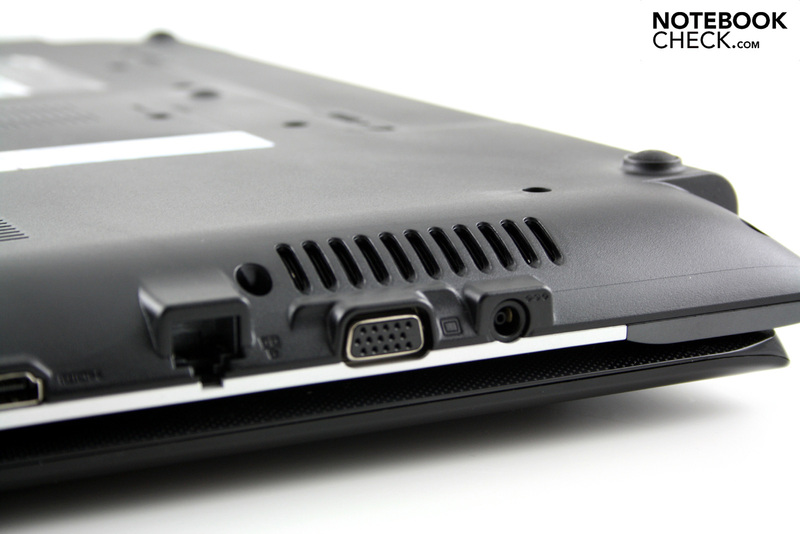 HDMI, 2 x USB 2.0 and the audio ports round off the left-hand side. 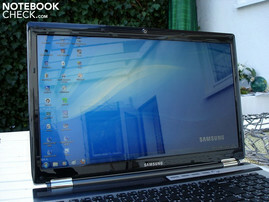 The input devices, which Samsung made an excellent job of. A better screen and longer battery life. How calmly the Samsung RF710 reacted to stress. Other 17-inch multimedia notebooks like the Acer Aspire 7745G, the Acer TravelMate 7740G, the Packard Bell EasyNote LX86 or the Samsung R780.